Size Matters – it does really! 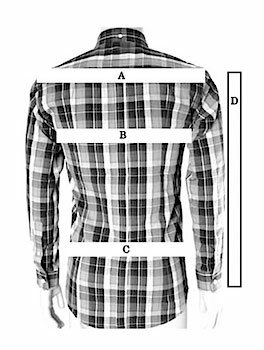 Nearly all of our clothing is slim fitting or very slim fitting – we want what you buy to fit you’ so it’s worth spending a few minuths reading the sizing guide. The sizing that we recommend in our guide will ensure a slim fit. If you want a little more room or you are not quite as slim as you used to be then it might be worth considering the next size up. 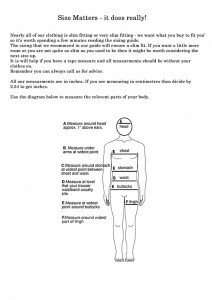 It will help if you have a tape measure and all measurements should be without your clothes on. Remember you can always call us for advice. These are cut on the small side. If your stomach is bigger than your chest then you might want to consider a larger size. Again these are very slim fit. We would suggest that if the measurement around your buttocks/hips is more than 4 inches bigger than your waist you should think about a size up from usual and use a belt or braces. The thigh size is also much smaller than regular trousers. All inside leg length is 32″. As we have mentioned in the shirt descriptions, all our shirts do come up very small and fitted.